Habitat by Richmark is a collection of curtains featuring updated styling and fabrics for today's living. As unique as one's personality, these curtains blend into contemporary or traditional decor. Modern faux silk grommet panel. Thermalogic is a curtain line featuring an insulating foam back treatment which is tested and approved by Infrared Thermal Energy specialists. This technical aspect transforms Thermalogic curtains into energy efficient panels that will make you save money on your energy bill by minimizing drafts through windows. Why choose Thermalogic insulated curtains? To get more restful sleep day or night due to blackout quality. Act as a sound barrier. Protect your furniture and keepsakes from sun-fading. White backing meets condominium requirements. Insulated textured grommet panel with curves inspired woven pattern. 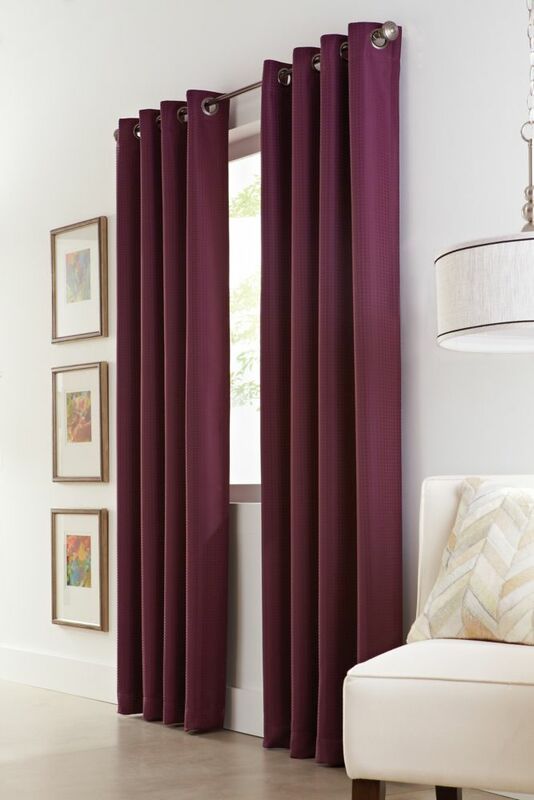 Aubergine Polyester Check Woven Blackout Curtain - 54-inch x 108-inch with Grommets in Black is rated 5.0 out of 5 by 1. Rated 5 out of 5 by Thomas from Great beautiful curtons Nice design and resonably priced. They fit exactly in my new bed room and have the same color as my bedding.